Don't waste a beautiful summer day indoors, crying about infertility. If you do need to cry, at least have your emotional breakdown outdoors while enjoying the sunshine. Suggestions include: by the beach, at a pool party or while eating an extra large ice cream sundae. Cry about infertility in the shower. That way no one will notice when you have tears running down your face and you won't need to blow your nose as much. 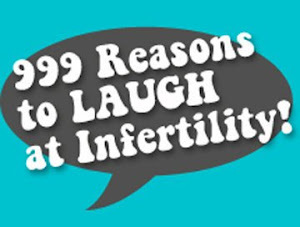 Other great places to cry about infertility: driving in the car while listening to a sappy song, at a wedding (the bride looks so beautiful, sob sob), or at your cousin's baby shower (everyone will think you're just happy for the expectant mom). The fertility drug, Estrace, will turn your urine blue. For some reasons, no one will inform you of this side effect and you will be quite surprised when you discover that you are peeing blue. So don't be alarmed if the entire cast of The Smurfs appear in your underpants. Mark Zuckerberg created Facebook to torture infertiles. It is now a place where your friends can complain about their pregnancy symptoms, post endless images of their ultrasounds and growing bellies, and daily photos of their children. He might want to rethink about naming it FertileBook. Don't talk about your cervical mucus over breakfast with your husband. Strangely, he doesn't want to hear about it while eating his eggs and toast. If you have a fertility appointment on Mother's Day, it's completely normal to want to purchase flowers and chocolates for the transvaginal wand and the embryos that will one day make you a mother. Note: But don't expect to find a Hallmark greeting card for this type of occasion.